In the alpha preview of Reaticulate, there is no GUI for creating custom banks. It'll come, but for now, you'll need to understand the nitty gritty on this page. You can take a look at the factory banks for inspiration, but if you want to start slinging your own custom articulation banks, the easiest way is to click the pencil button at the top of the UI and open the file in your editor. Clicking this will create the file if necessary before opening the editor. Open in Default App will launch whatever application you’ve associated with .reabank files. Once you save changes to the file, click the reload button (next to the pencil) to force Reaticulate to pick up the changes. The two numbers on the Bank line indicate the MSB and LSB of the MIDI bank. These values are between 0 and 127 and are somewhat arbitrary, as long as the pair is unique to the REAPER instance. Following that is an arbitrary name for the bank. User banks must use MSBs from 0 to 63. MSB of 64 and above are reserved for factory banks. Each subsequent line (until the next Bank line) specifies the programs for the bank. The number is the MIDI Program Change event number (which is technically arbitrary but see the Program Numbers section below for some advice), and the description is, in our case, the name of the articulation. Reaticulate extends Reabank files by adding special notations on lines starting with //! //! g="Spitfire/Symphonic Brass" n="Horn Solo"
//! m="Set patch to UACC"
Notated attributes take the form name=value (or name="value" if the value contains spaces) and are separated by whitespace. The line(s) prefixed with //! immediately preceding the uncommented line will annotate it with the supplied attributes. When an articulation is triggered, Reaticulate will emit the MIDI output events defined by the o attribute (see below). In the above example, each articulation sends a single MIDI event: CC 32 with a value defined by the second argument. The expectation for this factory bank is that the Spitfire Horns Solo patch be set to UACC (a feature of the patch itself). These are the supported attributes for Bank lines. Attributes are optional unless specifically marked as required. required Group name separated by slashes. Used to build a menu hierarchy for the bank. Generally should be Vendor/Product. n The name of the patch the bank describes. If not specified, the Reabank name is used. clone Clones the articulations in the specified fully qualified bank name (which is groupname/bankname). off For articulations with note-hold outputs, this defines the "default program" when no note-hold articulation is active. The GUI will show this program as active when a manually triggered note-hold keyswitch is released. When this articulation is explicitly activated via Reaticulate, it will cause any active note-hold articulation to be released. f Default articulation flags. Most can be overridden per articulation. Is a comma-delimited list of one or more of the options below. Any option can be prefixed with ! to negate it. toggle: Triggering the articulation when it's active will deactivate it. It will still emit the output events but the UI will indicate the articulation as off if it was previously on. hidden: Articulation will not be visible in the UI. When defined at the bank level instead of a specific articulation, the bank will not be available to add to tracks, however any existing references to the bank (e.g. in existing projects) will continue to work. required Articulation icon name. See Articulation Icons section below for possible names. n Overrides the articulation name for display in the articulation list in the Reaticulate UI. Program events as seen in the MIDI editor will use the program name specified on the uncommented line. g A group number between 1 and 4 (defaults to 1 if not specified). Only one articulation within a group may be active at a time. For consistency, it is recommended that you use group 1 for the main set of articulations. o One or more output events that describe the action taken when the articulation is triggered. This is where things get fun. See the Output Events section below for the gory details. Although the program numbers are arbitary and don’t influence any specific behavior, some form of standardization is recommended because this allows using the Reaticulate_Activate articulation by CC actions to trigger a given articulation (or at least its closest approximation) from a control surface, tablet, etc., no matter the underlying instrument. Reaticulate's factory banks will conform as closely as possible to Spitfire's UACC specification. 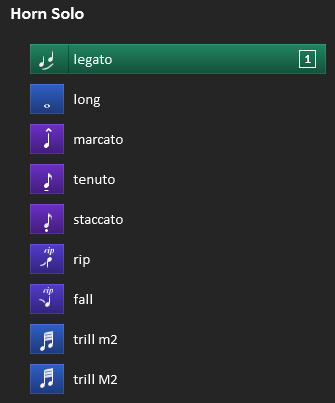 So, for example, by consistently using program 42 to map to spiccato, or some similar very short articulation, you could have a control surface send CC value 42 (via a CC number of your choice bound to the Activate Articulation action) to set spiccato, no matter what track is selected. This section is a bit nerdy. It's quite necessary to understand to build your own banks, but don't worry, there are some more approachable examples later. Programs can trigger up to 16 output events, specified by the o attribute, which ultimately describe the articulation’s behavior. Output events can be used to send a MIDI event to the virtual instrument to cause the underlying patch to change articulations, or even just to set up routing to some destination MIDI channel. Or both: you can have a program send a MIDI event to a specific channel, and subsequently performed MIDI will be routed to that channel. Multiple output events are separated by a / (forward slash) where each individual output event roughly takes the form type@channel:arg1,arg2 (no whitespace allowed). Output events prefixed with - don’t affect the routing of future MIDI events. Otherwise, if channels are not prefixed this way then any future user-generated MIDI event will be routed to this channel when the articulation is activated. type defines the type of output event (see below), e.g. note, cc, etc. @channel specifies the destination MIDI channel of the output event and unless type is prefixed with - it implies subsequent MIDI events will also be routed to that destination channel. When channel is not specified, the destination channel will be dictated by the destination channel the defined by the user when the bank was configured on the track. See the usage page for more information on source and destination channels. %filter_program if defined will only emit the output event if the specified program number filter_program is currently active on the same channel in another group. This allows the state of other groups to modify the output events emitted by the articulation. For example, you might have an articulation group that specifies normal attack vs hard attack with different programs. A single sustain articulation could then emit different keyswitches depending on whether the normal or hard attack is selected in the group. program Program change message. arg1 indicates the program number and arg2 can be omitted. note-hold A note-on event, where arg1 and arg2 are according to the note type. The corresponding note-off event is deferred until the next articulation is activated. This is useful with patches that use non-latching keyswitches. art Activate another articulation in the same bank, with arg1 being the articulation program number and arg2 is omitted. This can be used to create composite articulations. For example if you have articulation groups for con sordino/senza sordino and legato/non-legato, you could have another composite articulation for non-legato sustain con sordino that references the articulations in the other groups. Be aware that if multiple note output events are specified for a given articulation, all note-on events will be sent before any note-off event. This means as far as the target patch is concerned the notes will be simultaneously pressed. This is also true for note-hold events, except that of course in that case all the necessary note-off events will be deferred until the next articulation. The type can also be empty, specifying just @channel, in which case the action of the articulation will just be to set up routing to the destination channel specified, with no MIDI event emitted. Alternatively, if the type is prefixed with a - sign (e.g. -note) then the output event is emitted but routing of subsequent user MIDI events to the output event’s destination channel will not be done. This can be useful for example to send control events to listeners on other channels. If all the output events for the articulation are prefixed this way, then the destination channel routing setup by the previous articulation won’t be altered. Ok, with the technicals out of the way, here are some examples. This one from Cinematic Studio Strings sends 3 separate notes at specific velocities to set sordino and legato in addition to the sustains patch. A generic example where we have 3 individual articulation patches on 3 separate MIDI channels and we want to do simple routing only: no keyswitches needed by the underlying virtual instrument. Here’s another one from Cinematic Studio Strings, setting up spiccato without sordino. The twist is the “beefy spiccato” program, where we are setting CSS as with spiccato but also layering it with another patch on channel 2. Now for a more sophisticated example: an excerpt from the Bohemian violin bank. This instrument controls legato by a single note toggle keyswitch (hitting the same note repeatedly toggles legato), so this is in its own group. Most of the articulations in the Bohemian are only active while the note is held, and once the note is released, it defaults back to an intelligent, adaptive mode which VirHamonic calls the Performer. So the trick here is to specify an off program for the bank (we arbitrarily choose 0) which describes the default mode of the Bohemian when no articulations are explicitly chosen. Finally, the last 3 programs define the Performer styles, and unlike the others, these ones are latching keyswitches, so we use the note type for these. Suppose a trumpet library offered a number of different articulations with different types of mutes (no mute, straight mute, or harmon mute), with each variant being available under a different patch. The obvious approach would be to create different articulations for each of the normal vs hard attack variants. This is a perfectly cromulent strategy to be sure, but by using filter programs you could move the hard/normal attack flag to a group and use only a single program for each articulation even if it offers all three variants. Here we we have the three different patches for the different mute types on different MIDI channels. A single articulation definition can route to the appropriate patch depending on which mute articulation is selected. This bank uses programs 120-122 to define the different mute types. Notice there aren’t any output events with these articulations – they don’t actually emit any outputs directly, but rather they influence the output events emitted by the long and staccato articulations. Changing one of the mute types will retrigger long or staccato (whichever is selected) and cause the appropriate output event to be emitted for the new mute type. The c program attribute defines the color of the button for the articulation, which is either a HTML color code or one of the predefined names. When c isn’t specified, then the default color is used. 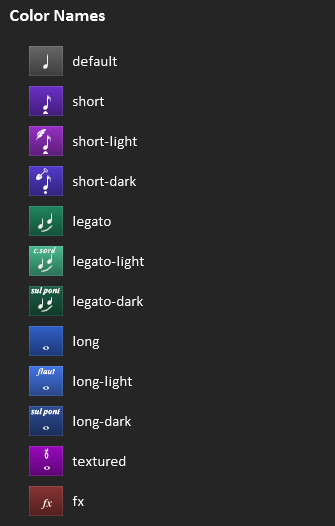 The image right shows the available names and their out-of-the-box colors. The factory banks use the light variants for articulations played more softly or subdued than normale, for example con sordino, sul tasto, or harmonics. The dark variants are used for grittier, distorted, or louder articulations, such as sul ponticello or Bartok pizzicato.